Hello, we are the Hargis family. We serve our wonderful Lord and Savior at Grace Baptist Church (GBC) in Harrisonville, MO under the leadership of Pastor Charles Kaighen. 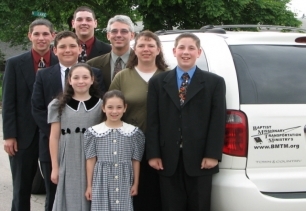 We are an Independent, Fundamental, King James Bible preaching, Soul winning Baptist family. We have lived in and near the Harrisonville area all of our lives and have been a part of GBC for over 18 years. My wife and I met at a very young age and have been married for 29 years. My name is Eric, I am 49 years old and Carla is 47 years old. We have six beautiful children which the Lord has trusted us with. Michael is the oldest (28), Joshua (26), Jordan (25), Malachi (23), Caitlin (20), and Calah (18). I am employed full time at General Motors Fairfax Plant, in Kansas City, KS. I have been with GM since April of 1996. Carla has been a homemaker since 1991. 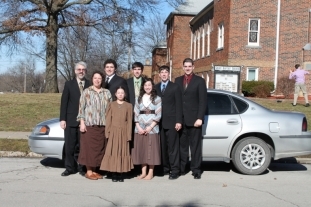 BMTM's main objective is to help Independent Fundamental Baptist Missionaries of like faith to have quality, dependable transportation when coming back to North America on furloughs. BMTM currently has 40 vehicles. We are praying that God will open the door to more vehicles being donated or purchased and that other Christians and Baptist Churches would help us out with what ever amount that the Lord lays on their hearts. This is a ministry, everything donated to BMTM will go directly to help with the purchase and maintenance of vehicles. Please pray about how the Lord can use you to help out in the ministry. Grace Baptist Church has always been a very missions minded-missions hearted church, which believes in getting the gospel out to all nations. Grace Baptist is currently supporting 52 missionary family's. God has put a burden in our hearts to help out missionaries as much as we can. I (Eric) had just accepted Christ into my heart and was saved on February 6th, 2000. Toward the end of February we had several missionaries come through Grace Baptist for our Annual Faith Promise Missions Conference (FPMC). Bro. Clayton Shumpert who was the special speaker had asked the question, "Would you consider helping out a Missions Board with vehicle repairs?" We also had a missionary at that meeting Bro. Mark G from Christian Laymen Assisting International Missionaries (CLAIM) which is through Baptist International Mission, Inc. (BIMI). Mark was inspired by one of the men of our church, Bro. Jim Savage, to start a car clinic during a missionary enrichment week that is held annually at BIMI. The first car clinic was in July of 2000. We felt led to start helping out in July of 2001 and went several years except for the year 2006 up to 2009. As we worked on missionaries vehicles at the car clinic, along with seeing missionaries who are traveling on deputation and furloughs saw the need to help out more. One of the other men at the car clinic, Ralph Sanchez, told how he was working on starting up a vehicle program out of their church in Waco, Texas. They would supply vehicles that missionaries could use while traveling and then get the vehicle ready for the next missionary. The Lord continued to work on me at church camps, FPMC, and Missions boosters. I finally put it all in the Lord's hands at our 2007 FPMC. I started researching heavily on the Internet, along with talking with Ralph Sanchez and found that there are a few groups similar to what the Lord had laid on Ralph and my hearts. We will add links to these that have web sites in the near future. 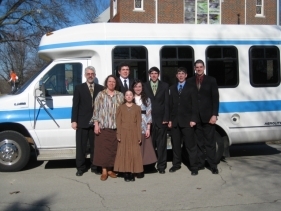 This became the beginning of Baptist Missionary Transportation Ministry (BMTM). We hope to be able to supply as many vehicles to missionaries as the Lord will provide. We have a very reliable mechanic at the shop we us, who repairs our vehicles and checks them out thoroughly. We sent our first vehicle out on May 18th, 2007 which was on the road until April 1st of 2008. If you have any advice or input we would be glad to hear from you. You can e-mail us through our contact page or directly at ServingforChrist@aol.com . Please keep us in your prayers. For the Lord to continue to use our family to help further the kingdom. For finances to come in to help keep BMTM going and for us to be a blessing to missionaries. For the buildings on the property to be repaired and paid for. To get the shop up and running with a vehicle lift, tire machine and a tire balancer along with other needed tools and supplies. To set up a future prophets chamber on the property, office space and to finish the remodel on the house. For our children to have the desire to serve the Lord and a heart to serve His people.